“I don’t understand you Glugar!” Clara yelled while lying in her bed. “I thought you said she’s always crazy,” replied Julian a little confused. “Well little bro, yes, but … she has days that I really can’t understand her at all! She goes CRAZY for no reason!” said Clara very frustrated. “What did you do to her?” asked Julian. “What did I do to her? WHAT DID I DO TO HER? … NOTHING! Just the usual ‘stuff’ to keep her happy. That’s all!” Clara yelled angrily. “STOP THAT!” Clara yelled again even more frustrated. “Oh, I see … you want to play detective! Right?” interrupted Clara. “Maybe … anyway, let me help you!” Julian begged. “Help me? HELP ME? I DON’T NEED ANY HELP!” yelled Clara. “Oh, yes you do! At least, to me it looks like you do!” Julian said calmly. “Do I? DO I?” screamed Clara moving like a mad clown. “You’re acting really weird today …” Julian observed. “It’s Glugar’s fault little bro! Duh!” Clara said making a face. “Who’s accusing me?” Glugar’s voice filled the room. “No one!” both Clara and Julian replied very surprised at the same time. “Look who’s talking about fairness! 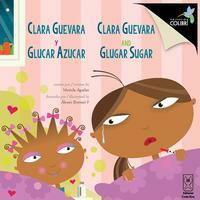 Oh, don’t start me Glugar …” Clara became angry again. “So, what should Clara do?” asked Julian. “Calm down, change her attitude, and do her best with me … because otherwise she won’t go anywhere! Eventually I’ll calm down too, and we’ll go back to living ‘normal’ again … but she already knows that!” answered Glugar. “I have a head!” exclaimed Glugar. “That’s my friend!” cheered Glugar.